As we approach the two-year anniversary of the U.S. Supreme Court’s decision in Alice Corp. v. CLS Bank Int’l, 134 S. Ct. 2347 (2014), a survey shows that almost all of the Court of Appeals for the Federal Circuit’s decisions on patent eligibility in the non-life sciences arts have held patent claims to be ineligible as directed to an abstract idea that fails to recite significantly more. Two Federal Circuit decisions, however, have held patent claims to be not directed to an abstract idea, thus patent eligible: DDR Holdings, LLC v. Hotels.com, L.P., 773 F.3d 1245 (Fed. Cir. 2014), and Enfish, LLC v. Microsoft Corporation, No. 2015-1244 (Fed. Cir. May 12, 2016). In a sea of Alice rejections, DDR Holdings andEnfish serve as a guide to what the Federal Circuit believes are non-abstract, patent eligible claims. The patent at issue in DDR Holdings involved generating a composite web page that retained the “look and feel” of the host website. See U.S. Patent No. 7,818,399. In holding that the claims of the ‘399 patent were patent eligible, the Court reasoned that the claimed invention was “necessarily rooted in computer technology in order to overcome a problem [(i.e., retaining website visitors)] specifically arising in the realm of computer networks.” The Court explained that the patent claims do not merely recite some business practice known from the pre-Internet world along with the requirement to perform it on the Internet. 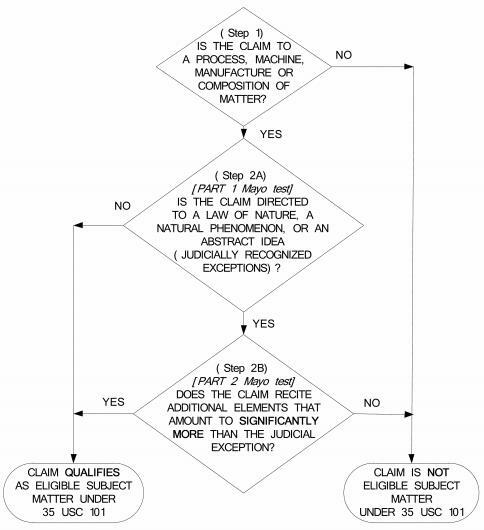 Notably, the Court appears to have arrived at this conclusion at step 2A, as depicted by the U.S. Patent and Trademark Office (see graphic, below), of theAlice test. Therefore, the Court concluded that the claims were simply not directed to an abstract idea. Further scrutiny in step 2B (i.e., whether the claims recited “significantly more” than an abstract idea) seemed unnecessary. Shortly after Enfish, the USPTO released a memorandum to its patent examiners. See http://www.uspto.gov/patent/laws-and-regulations/examination-policy/examination-guidance-and-training-materials. In its memo, the USPTO noted that “an examiner may determine that a claim directed to improvements in computer-related technology is not directed to an abstract idea under Step 2A of the subject matter eligibility examination guidelines (and is thus patent eligible), without the need to analyze the additional elements under Step 2B.” The memo also reiterated to examiners that “when performing an analysis of whether a claim is directed to an abstract idea (Step 2A), examiners are to continue to determine if the claim recites (i.e., sets forth or describes) a concept that is similar to concepts previously found abstract by the courts.” (underlining added). Notably, although the Enfish court provided guidance as to how that Court believes the “directed to” inquiry should be applied, the USPTO’s memo simply reiterated their previous guidance without expressly including clear, additional guidance to examiners on that front. As Alice turns two in June, other litigants are vying to provide more clarity to the meaning of patent ineligible “abstract ideas.” Two district court decisions to watch on appeal are McRo, Inc. v. Naughty Dog, Inc., 49 F. Supp. 3d 669 (C.D. Cal. 2014), and Thales Visionix, Inc., v. United States, No. 14-513C, 2015 WL 4396610 (Fed. Cl. July 20, 2015). Banner & Witcoff recently partnered with Bloomberg BNA for the webinar, “Overcoming Alice: An Empirical Analysis of Granted Patents Since Alice. Please click here for more information.